Implementing the Resolution of the Party, the Central Military Commission and the Ministry of Defense directed the drafting of the Project "The Vietnamese People's Army participates in the United Nations peacekeeping operations (UNPKO) in the 2014-2020 period and the coming years" which was approved by the Prime Minister. The Ministry of Defense, on December 4th, 2013, issued Decision No.4792/QĐ-BQP on establishing the Vietnam Peacekeeping Center. The center is a standing body which assists the Steering Committee of the Ministry of Defense on issues related to Vietnam’s participation in the UNPKO. It was tasked with carrying out researching and advisory work and monitoring the entire process of preparation and participation in the UNPKO. Under the requirements of the situation and the development of tasks in the new period, implementing the Resolution of the Standing Committee of the Central Military Commission, on November 22nd, 2017, the Ministry of Defense issued Decision No.5291/QĐ- BQP on reorganizing the Vietnam Peacekeeping Center into Vietnam Department of Peacekeeping Operations. 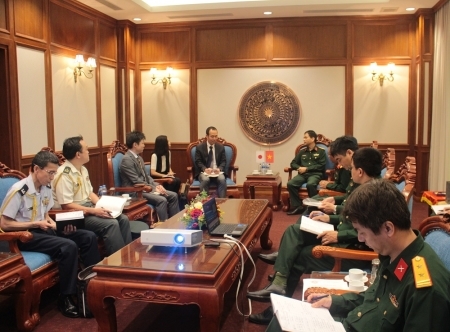 At the same time, according to the Project, the Central Military Commission and the Ministry of Defense directed and guided the transfer of the Standing Office of Vietnam Inter-sectoral Working Group for Participation in the United Nations Peacekeeping Operations to the Ministry of Defense from the early of 2018. The reorganization is an essential determinant for the development of the Army’s participation in the UNPKO to a new height. Under the direction and guidance of the Central Military Commission and the Ministry of Defense, Vietnam Department of Peacekeeping Operations (formerly Vietnam Peacekeeping Center) has coordinated with the functional bodies of the Ministry of Defense, the central agencies, and the UN Office for Peacekeeping (UNOP) in synchronously implementing the contents of the Project, including the improvement of mechanisms, policies, and legal basis for the Army to participate in the UNPKO outside the Vietnamese territory, negotiation and signing of the Memorandum of Understanding (MOU) with the UNOP, organization of training for officers on relevant matters, preparation of personnel and equipment (at individual and troop level) in accordance with the UN standards, or direction and coordination of all activities of Vietnamese forces in missions, etc. By 2017, Vietnam has sent 20 military officers to peacekeeping missions in the Central African Republic and Republic of South Sudan, including a female officer. Vietnamese officers have been highly appreciated by the UNOP for their professional qualifications, ability to organize independent work and group coordination, and compliance with regulations in relation to relevant agencies and organizations and local people. In particular, the Army has actively prepared in all aspects to contribute troops to the UNPKO, among which Military Hospital 175 is assigned by the head of the Ministry of Defense to directly prepare Vietnam’s first Level 2 (2.1) Field Hospital. The preparation includes a number of contents such as organization and staffing (approximately 70 people, including commanders, doctors of different specialties, nurses, technicians, and professional staff) and thousands of medical, logistical, and technical equipment and supplies for troops and personal domestic appliances, which helps ensure operational independence in accordance with their functions and tasks. Officers and staff of the Field Hospital must ensure their professional qualifications (diplomas, certificates, or practical experience, etc), health, and foreign language proficiency ​​according to the UN standards (IELTS band score 5.0 - 5.5). Moreover, vehicles and medical, logistical, and technical equipment must be of appropriate quantity, type, quality, and technical standards of the UN. With the efforts of Vietnam Department of Peacekeeping Operations, directly Military Hospital 175, and the support and coordination from the functional agencies under the Ministry of Defense, especially the Department of Foreign Relations, Department of Personnel, Department of Military Forces, the General Logistical Department, the General Technical Department, etc. so far, we have completed all preparatory work. In early 2018, the pre-deployment inspection team of the UNOP directly inspected the 2.1 Field Hospital for its personnel, facilities, equipment, and technical and field coordination skills and concluded that Vietnam has well prepared, fully met all contents and requirements, and been capable of performing tasks at the South Sudan Mission. According to the plan, in May 2018, the 2.1 Field Hospital will commence and mobilize its forces and equipment to the South Sudan Mission with the transportation support from Australia. From operational experience and results of the 2.1 Field Hospital, Vietnam is preparing to deploy an Engineering troop (four times larger than the Level 2 Field Hospital in term of personnel), a 2.2 Field Hospital (organized by the Military Medical Academy), and other units to participate in the UNPKO in 2019 and the coming years. The deployment of the 2.1 Field Hospital or the Engineering troop to the UNPKO has marked a new development in Vietnam's efforts to fulfill its obligations in an important field of the UN’s operations. It is also a specific form of implementing the Party's policy on "actively participating in multilateral defense and security mechanisms, including involvement in higher level cooperation activities such as the UNKPO, non-traditional security exercises, and other activities." Concurrently, the deployment is a vivid evidence for Vietnam’s responsible membership to the international community, which significantly contributes to enhancing the country’s position and prestige in addressing international issues, promoting multilateral cooperation, and creating favorable conditions for the promotion of political, economic, and commercial relations with international organizations and countries in the world and the region. Besides, it also raises the prestige of the Vietnam People's Army and contributes to enhancing international cooperation on national defense and security. Firstly, the participation in the UNKPO requires strict compliance with the policies and the Constitution under the close, concentrated, and unified leadership of the Party and the State. During the course of implementation, the Central Military Commission and the Ministry of Defense should thoroughly grasp and strictly implement the Party's and the State's viewpoints and policies on foreign relations and international integration. The Army should determine that this is one of its political tasks in the new era. The appropriate forms, scales, missions, or areas of the UNKPO should be selected to suit with the Party’s policies, national interests, the Constitution, and Vietnam laws and to adhere to the basic principles of international laws and the UN Charter. During the course of implementation, it is necessary to show a positive, active, but cautious stand and participate in the fields where Vietnam has experience and strengths and has been widely supported by the international community or in the countries where peace agreements and the UN’s decisions are in place. At the same time, the Army should only participate in supporting and overcoming the consequences of war and creating peace for humanitarian purposes without involving in coercion and combat activities to ensure the independence of its force commanding when participating in missions under the MOU with the UNOP on field missions. Secondly, close coordination with other central committees, ministries, and agencies should be paid with much attention when participating in the UNKPO. In addition to favorable conditions, Vietnam’s participation in the UNKPO has encountered several difficulties as they take place in a multinational environment with the involvement and coordination of various forces under the UN’s framework and standards which differentiate from the familiar working and fighting environment of the Vietnamese People’s Army. Besides, operating far away from the country and under complex natural, political, and social conditions exposes us to potential risks, even casualties. Moreover, Vietnamese laws have a number of aspects that need to be adjusted and supplemented to suit the new environment and fields of operation. Under these circumstances, in order to meet the UN’s standards and fulfill the required preparation contents, it requires the involvement of central branches, ministries, and sectors. Under the leadership of the Politburo and the Secretariat, direction and administration of the Government, and close coordination from the Ministry of Foreign Affairs, Ministry of Public Security, Ministry of Education and Training, Ministry of Labor, War Invalids and Social Affairs, and Ministry of Public Health, the Central Military Commission and Ministry of Defense have concentrated on directing and guiding the synchronous implementation with the highest requirements. This is a decisive factor for the performance of the Army's tasks to meet the UN’s requirements and standards and ensure the fulfillment of missions. Thirdly, comprehensive preparation in all aspects from policies, legislation, and force organization to equipment, training, and security should be well performed. Among which, importance should be attached to the selection of suitable personnel. Due to high workload, urgent time, and officers and soldiers’ lack of practical experience in coordinating multinational activities, it is essential to supplement knowledge of international laws and improve foreign language proficiency. Therefore, the Central Military Commission and the Ministry of Defense should resolutely direct the implementation of the guideline “Careful preparation is a decisive to win.” Together with careful and synchronous preparation of organization, equipment, professional knowledge, laws, and foreign language proficiency, attention should be paid to the Party and political work, security, and safety to ensure better fulfillment of tasks of individuals and units and promote the image and traditions of the heroic and victorious Vietnamese People's Army in the new environment and field of operations.